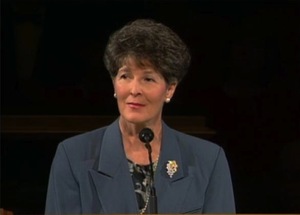 Patricia Peterson Pinegar served as the ninth president of the Primary organization of The Church of Jesus Christ of Latter-day Saints. During her administration (1994–1999), the Primary curriculum was simplified—all Primary classes would be taught from only three different manuals a year, depending on the ages of the children. The Achievement Days program for girls 8 to 11 years old was expanded to parallel the Cub Scout program for boys. Prior to her call, she served as a counselor to Janette C. Hales in the Young Women general presidency. She has served in in many other capacities in the Church of Jesus Christ, including missionary in the New York Rochester mission with her husband, Ed J. Pinegar, and matron of the Manti Utah Temple. She also served with her husband as he presided over the England London South Mission. Pinegar was born on February 3, 1937, in Cedar City, Utah. She grew up in Utah, California, and Hawaii. She attended Brigham Young University. She and her husband married in the Salt Lake Temple in 1956 and are the parents of eight children. This page was last edited on 25 June 2015, at 13:56.